The global WiFi hotspot market is projected to witness exponential growth in the ensuing years, on account of rising penetration of smart devices across the globe, serving an array of purposes such as video calling, geo-tracking, temperature control, home security, entertainment, and much more. In an era embroiled by state-of-the-art technological advancements, the utilization of WiFi hotspots holds more value than is estimated. A WiFi hotspot creates an area with wireless internet accessibility, often used in places like airports, offices, colleges, and coffee shops. In the year 2017, WiFi hotspot market size was valued to be more than USD 10 Bn, with an installed base of nearly 300 Mn units. Primarily driven by the growing number of public WiFi hot-spots worldwide, the overall WiFi hotspot market is projected to grow at a CAGR of 12% over 2018-2024. In terms of the geographical landscape, Europe is currently the dominant region in WiFi Hotspot market, holding more than 35 percent of the overall share, attributed to the adoption of WiFi hotspots at public places. Asia Pacific is another lucrative WiFi hotspot market, which is predicted to attain a CAGR of over 15 percent during 2018-2024, because of the immense proliferation of smartphones devices and a giant internet user base in the region. In the coming years, India will be a major contributor to the global market share, as the Indian telecom industry has plans to roll out about one million WiFi hotspots by 2019 year end. Reportedly, Jio, BSNL, Vodafone, Airtel, and Idea, the leading telecom service operators, have joined forces to install one million WiFi hotspots across the Indian territory in a year’s time. Considering the current scope of WiFi hotspots in the public & private spaces, it would not be incorrect to state that the WiFi hotspot market is set to emerge as one of the most opportunistic commercial arenas of recent times. Aptilo Networks, a producer and marketer of software systems for WiFi services & mobile data, holds a strong footprint in the global WiFi hotspot market inspired by innovative & customer-centric solutions. In a recent turn of events, Aptilo Networks along with Swisscom has won the WiFi NOW Award for the 'Best WiFi Service Provider', besides securing the award for 'Best Service Provider WiFi solution' for its novel Consent & Personal Data Management Solution. Lately, Swedavia, which owns and manages the top Sweden airports, has reportedly extended its decade-long collaboration with Aptilo Networks to provide carrier’s WiFi services to all state-owned airports in Sweden. Swedavia runs ten airports including Bromma Stockholm Airport, Göteborg Landvetter Airport, and Stockholm Arlanda Airport. Roughly 30,000 people use Swedavia’s WiFi facility daily. This ongoing collaboration will bring about an abundant revenue in-flow for Aptilo Networks, thereby augmenting WiFi hotspot industry. Boingo Wireless, an American company offering mobile Internet access for wireless-enabled consumer devices, has won the ‘Best WiFi Service’ award eight times, given by Global Traveler magazine, on account of premium, prompt, and innovative solutions for keeping the world connected. Boingo Wireless has recently announced that it would be launching its exemplary WiFi services at 54 airports in Brazil, which are managed by Infraero, one of the biggest operators of commercial airports worldwide. In a recent turn of events, Boingo Wireless has announced that it would acquire Elauwit Networks, LLC, a foremost provider of high-speed WiFi & technology solutions to the students and multi-family housing market, for a total cash value of $28.0 Mn. In view of this deal, Boingo expects to enlarge its operative market for venues by an added 16 Mn multi-dwelling units across the U.S., thereby significantly boosting WiFi hotspot market share. 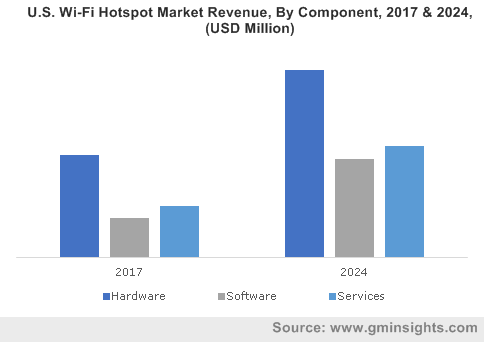 The explosion of innovative technology, smart solutions, and the momentous rise in the tech-savvy population are considered as the major drivers for WiFi hotspot market over the approaching years. Major WiFi giants along the likes of Ipass, Nokia Networks, Aptilo Networks, Netgear, Ericsson, Boingo Wireless, Cisco Systems, and Aruba Networks partaking in the WiFi hotspot industry sphere, are expected to largely rely on collaborations and acquisitions to expand their revenue share in the ensuing years.